Urban Infrastructure Design of BIG U. Select to upgrade Lower Manhattan, Newyork is one of six winning solutions to protect U.S. Cities from increasingly intense weather events. Founded in 2013 as a response to Hurricane Sandy’s devastation. 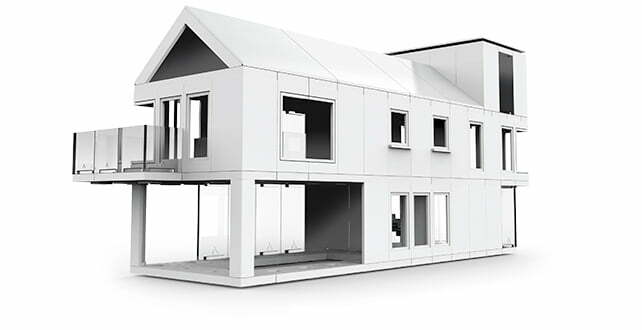 Rebuild by Design called for an innovative community. And policy-based solution to promote resilience in the Sandy-affected region. Urban Infrastructure Design of Big U is selecte as one of the winners of the year. A long competition among ten multidisciplinary design teams. And a total of 148 international applicants. The winning proposals are truly trans-formative and serve as blueprints. For how we can safeguard the region and make it more environmentally. And economically resilient. Said Secretary Shaun Donovan. It’s my hope that Rebuild by Design will inspire other public-private partnerships to spur innovation. And resilience in other parts of the country and around the world. By investing in these proposals, we are going to ensure that when the next storm comes. The region will be safer and better prepared. BIG and Dutch firm One Architecture co-developed the winning Big U scheme. As a protective system that would extend ten miles around the tip of Manhattan island. 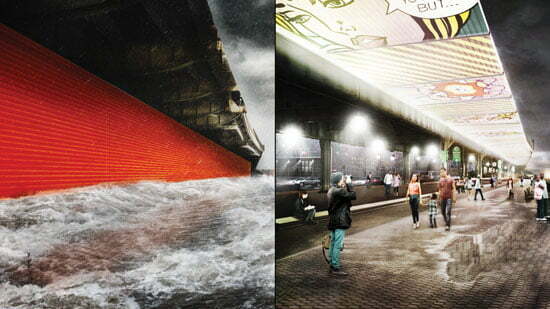 Shielding buildings from floods and storm surges. 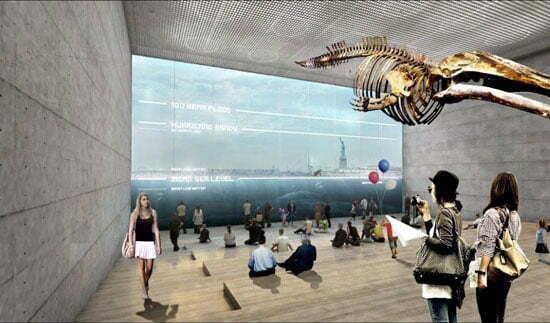 The BIG Team is awarding $335 million to increase resiliency in Lower Manhattan. Protecting the city against future storm surges. While providing social and environmental benefits to the local community. 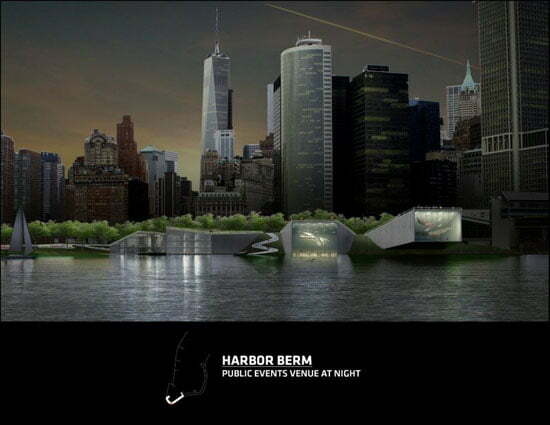 The berm will be planted with a selection of salt-tolerant flora, and will provide public spaces. And viewpoints as well as routes into the East River Park. 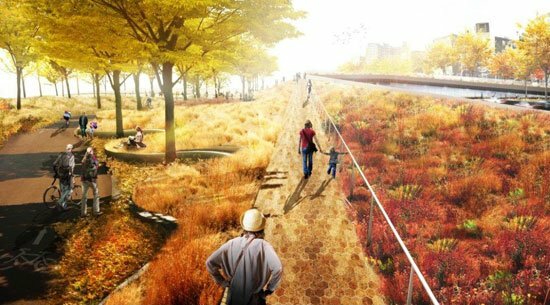 BIG founder Bjarke Ingels has drawn comparisons between Big U and New York’s High Line park. 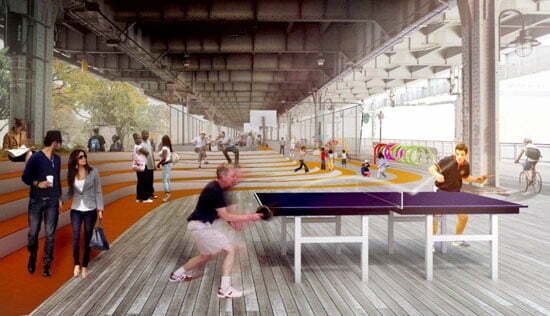 Which also opened in sections along a disused elevated railway on the west side on Manhattan. 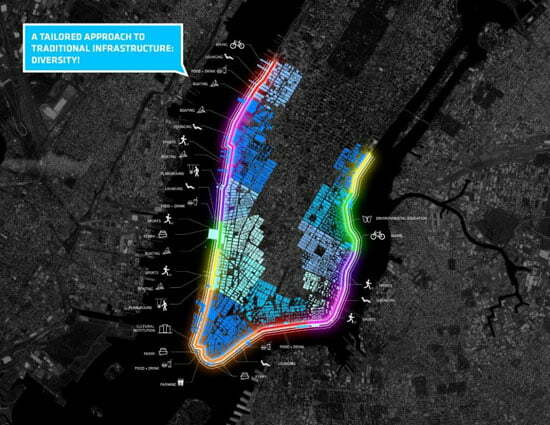 Coined the Urban Infrastructure Design ‘Big U’, the systematic approach encircles Manhattan responding directly to the needs and concerns of the area’s communities. Running from West 57th Street south to The Battery and up to East 42nd Street, the Big U protects 10 continuous miles of low-lying geography that comprise an incredibly dense, vibrant, and vulnerable urban area. The team’s approach [ check : Management Never Know] is root in the two concepts of social infrastructure and hedonistic sustainability. The Urban Infrastructure Design of Big U not only shields the city against floods and storm water. It provides social and environmental benefits to the community, and fosters an improved public realm. 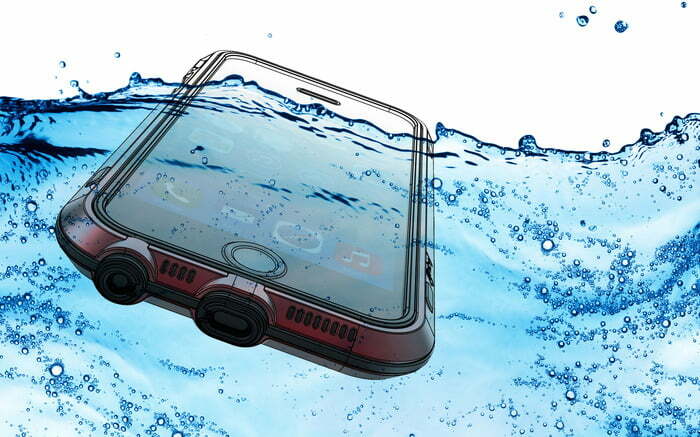 The team envisions three compartments that function independently to provide flood protection. Each compartment comprises a physically discrete flood-protection zone that can be isolated from flooding in adjacent zones. At the same time, each presents opportunities for integrated social and community planning. The compartments work in unison to protect and enhance the city, yet each compartment’s proposal is designed to stand on its own. “The Urban Infrastructure Design Big U is an example of what we call social infrastructure,” said Ingels in a statement. The Urban Infrastructure Design of Big U will not only make the waterfront more resilient but also more accessible and inviting to the citizens around it.” Bjarke Ingels, Founding Partner, BIG. 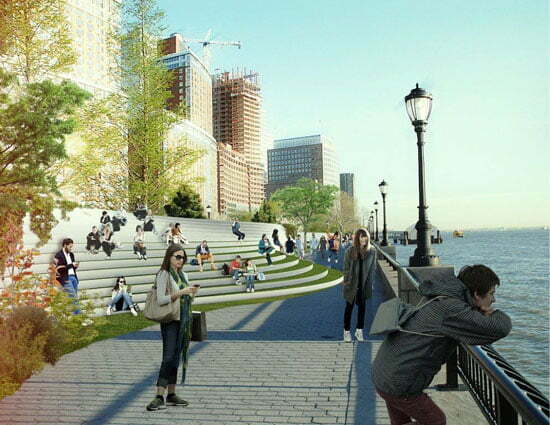 The Urban Infrastructure Design will eventually include three connected sections that will create new public spaces running from West 57th Street, down to The Battery park and up to East 42nd Street. 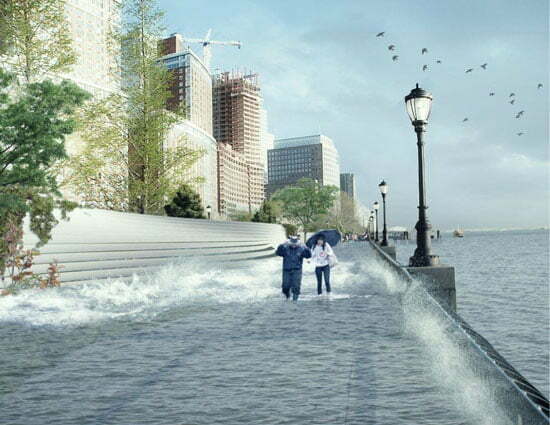 Each is to comprise a physically discrete flood-protection zone, which can be isolated from the others in an emergency. 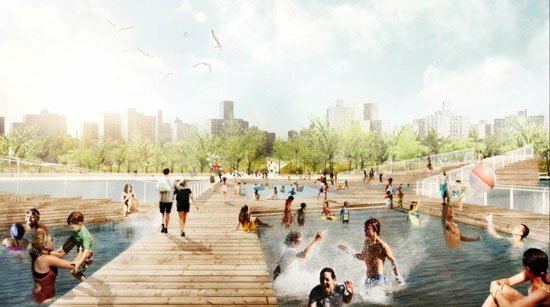 “We asked ourselves: What if we could envision the resilience Urban Infrastructure Design for Lower Manhattan in a way that wouldn’t be like a wall between the city and the water, but rather a string of pearls of social and environmental amenities tailored to their specific neighborhoods, which also happens to shield their hinterlands from flooding,” Ingels said. Proposed Urban Infrastructure Design solutions for the components were designed in close consultation with the associated communities and a number of local, municipal, State and Federal stakeholders. Matthijs Bouw, founder of co-lead One Architecture comments: “The Urban Infrastructure Design of Big U really shows the power of design in building coalitions. 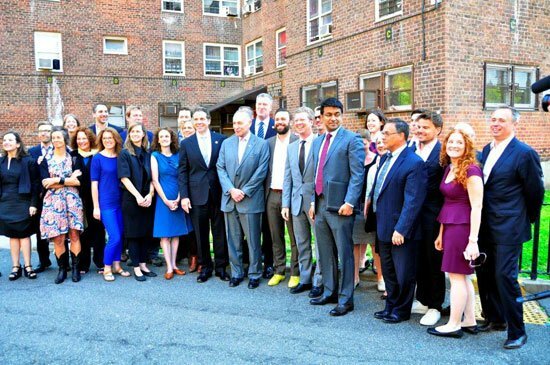 In an intensive process with the community, the city and the housing authority we discovered how a well-designed flood protection system can have multiple benefits: housing preservation, improved urban spaces, and jobs. Sometimes people say about climate change that it is really a problem that is shared by everyone. 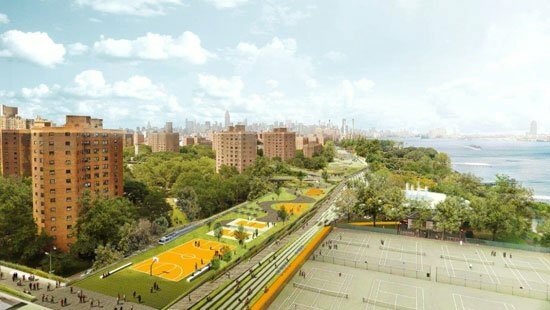 CDBG-DR funds will be used to implement the first phase of the proposal along the Lower East Side, creating a ‘bridging berm’ at the East River Park. 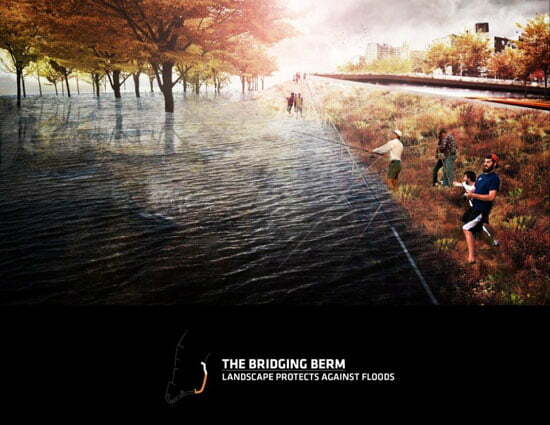 The bridging berm provides robust vertical protection for the Lower East Side from future storm surge and rising sea levels. The BIG TEAM includes BIG – Bjarke Ingels Group (architecture), One Architecture (water & urban planning), Starr Whitehouse (landscape architecture), James Lima Planning & Development (finance & economics). Green Shield Ecology (ecology), Buro Happold (engineering & sustainability), Level Infrastructure (engineering), Arcadis (hydrologic engineering). AEA Consulting (arts & cultural planning), Project Projects (graphic design), and the School of Constructed Environments at Parsons the New School for Design.